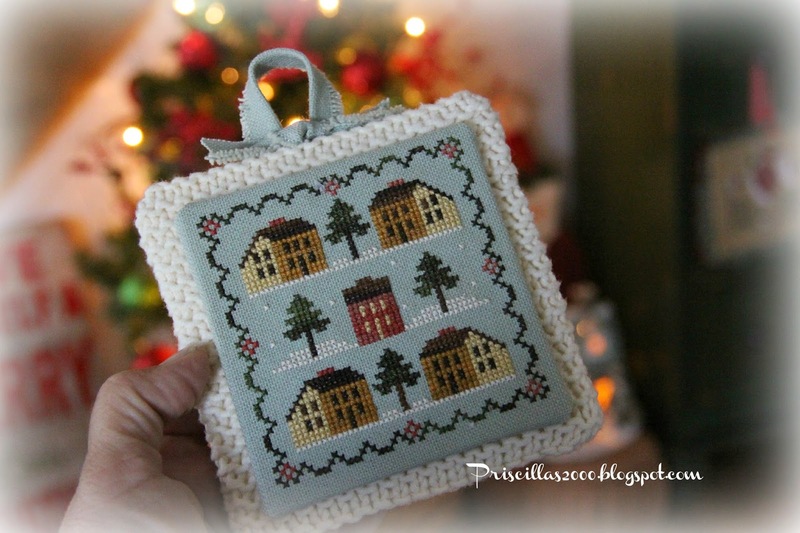 This morning I set out to finish this ornament from Little House Needleworks..Saltbox Village that I stitched last winter and also Silent Night from Country Cottage Needleworks..None of the backing fabrics was working so I used a sleeve from a thrift store sweater ! This is probably my favorite ornament finish ever ! 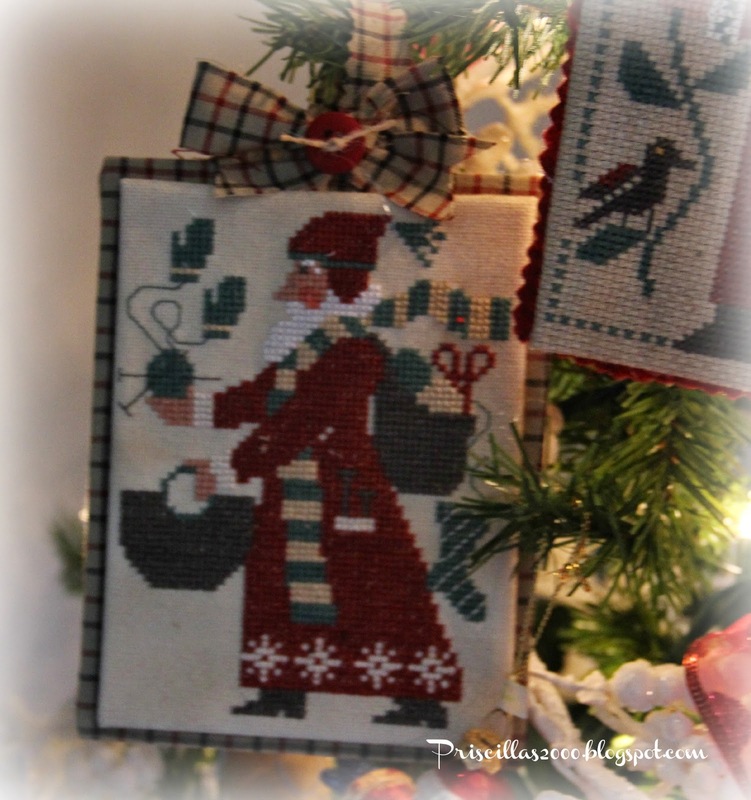 I used light blue fabric to stitch these that I tea and coffee dyed.. For the ornament I also used the blue fabric for the hanger.. I bought this square frame at The Goodwill for 99 cents.. 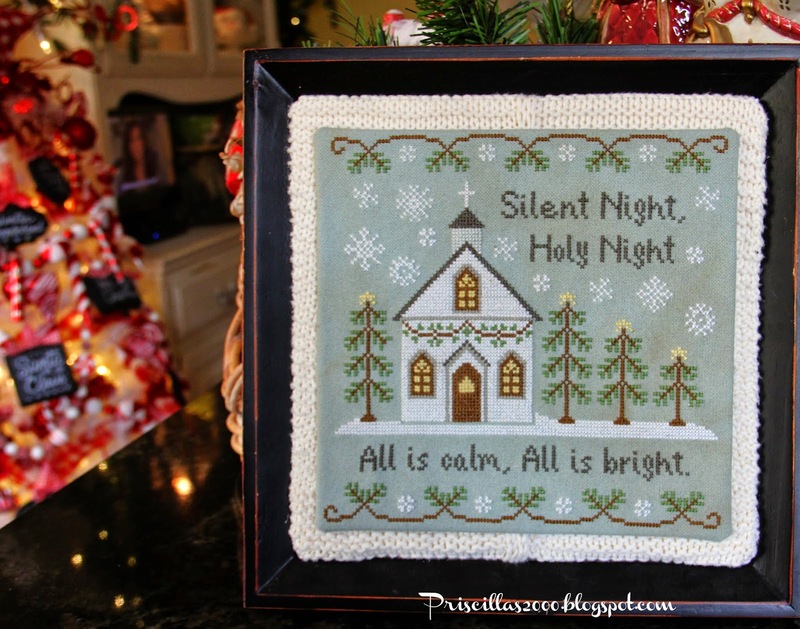 I used sticky needlework board and wrapped the sweater sleeve around it and hot glued it to the back..Then hot glued it to the design that was in the frame.. 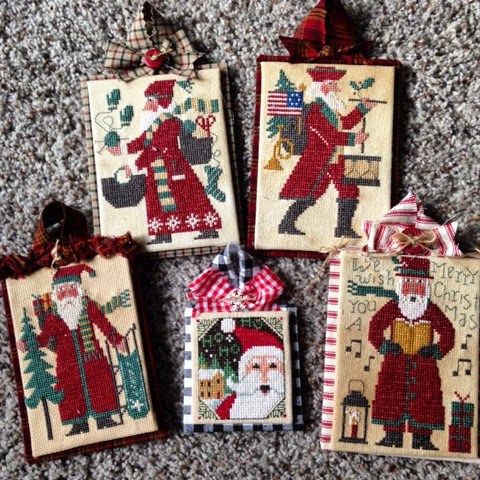 Yesterday the 5 Prairie Schooler Santas I stitched this year got finished and hung on the Santa tree! 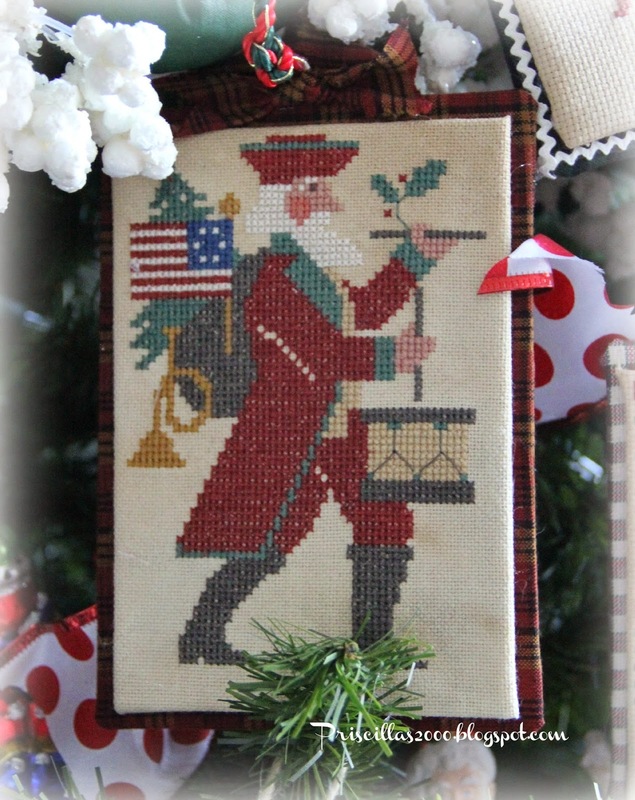 This years on Red and white ticking stripe..
Love this one with the black and white check.. I did a ruffle from the homespun and twisted it ont he top of this one..
and here they all are .. Last year I did alot more ! 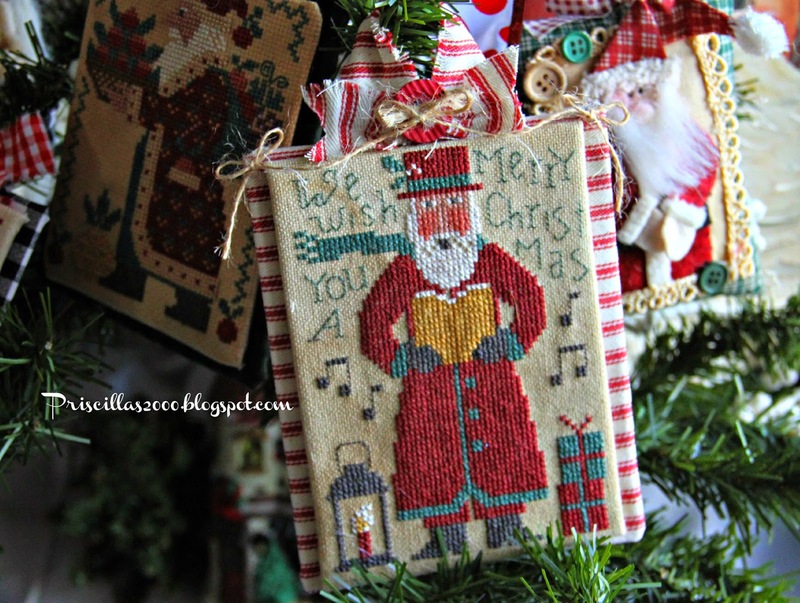 Oh, you are so creative, Priscilla--love the sweater idea :) And the PS Santas are wonderful--each and every one. I think you did quite a few this year!! I have loved cross stitch for years, but haven't had time latelyy...must remedy that. Love your pieces! I love seeing all the Christmas ornaments. You have done a wonderful job finishing them. That's the part that always slows me down. 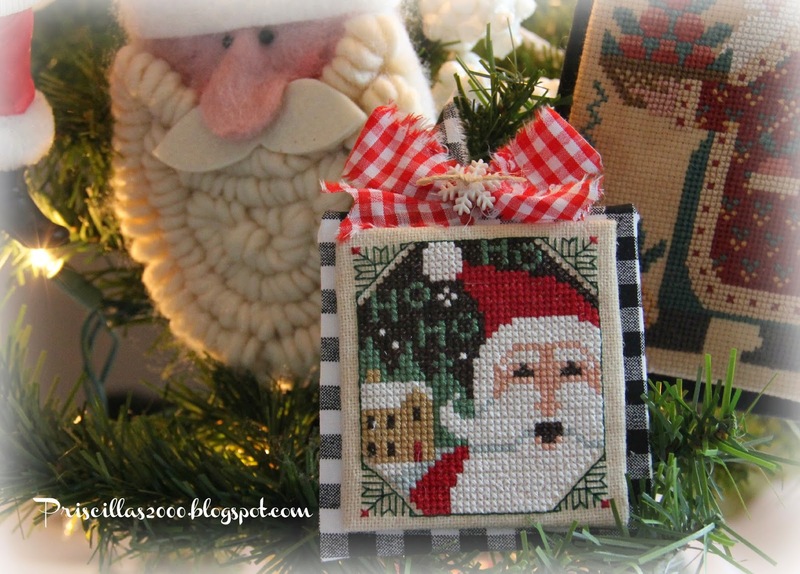 I really enjoy seeing your cross stitch..you are very talented! As always, everything looks beautiful! 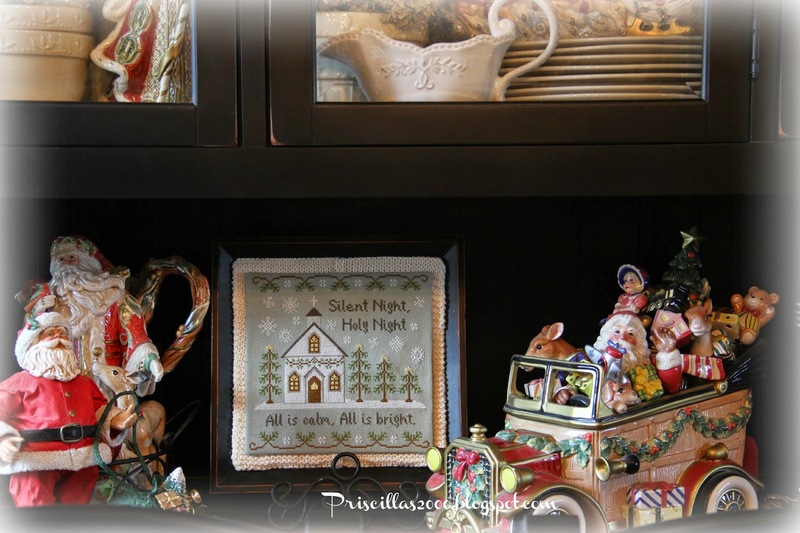 All adorably finished and your home is once again a showcase! 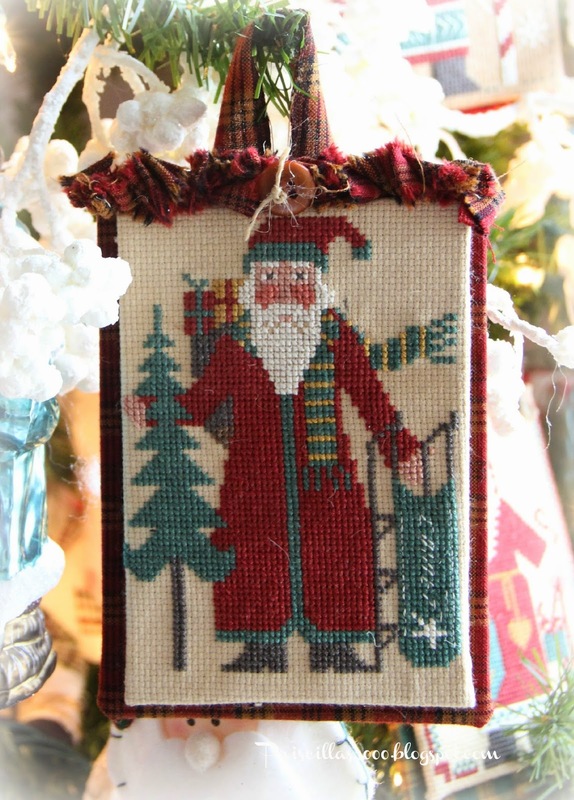 I love Prairie Schooler designs and your Santas are so sweet. All your backing ideas are great! It's been so long since I've cross stitched... I'm putting that on my calendar for next year! They look very nice and well made. I'm sure you'll enjoy them! You amaze me at what you accomplish Priscilla. They are all just wonderful! thanks for sharing with SYC. 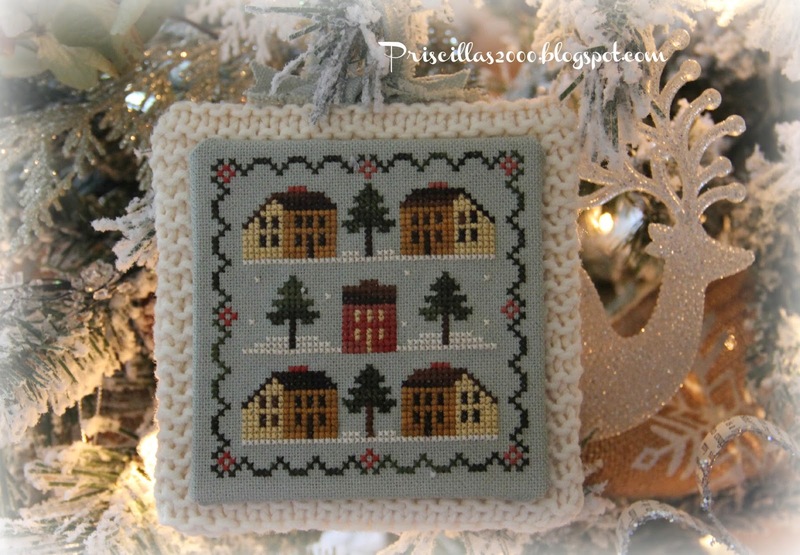 Priscilla, your Christmas stitchery is adorable. I'm a hand stitcher and appreciate the time and effort that goes into each one of these. Great Job! Beautiful finishes and using a sweater is very creative. Love those Santas. Your finishes are very inspiring.